We must be reaching the end of the current console generation. Why do I say this? Because downloadable games are being offered cheaper than ever before in the hopes that we fill our hard drives with content that will most likely not be transferable. Microsoft reduced a load of games last week, but Serious Sam 3: BFE also got in on the action receiving a permanent reduction to 800 Microsoft Points. The XBL version of Serious Sam 3 is only 4 player co-op, which is down from the 16 players who can join up on PC. This does not stop it from being one of the better games in the series, full of old school entertainment. Both the core game and the Jewel of the Nile DLC have received a price reduction to 800, meaning you can get a lot of game for 1600 MSPs. Jewel of the Nile picks up somewhere near the end of the BFE campaign as Sam is heading home for some well-deserved R&R. As it turns out, there's yet another alien artefact to power up and he must embark on a brief, albeit challenging campaign exploring the Temple of Isis. Toss in an upgraded sniper rifle, four-barrel laser gun and a battle-axe to play with, and you're set. 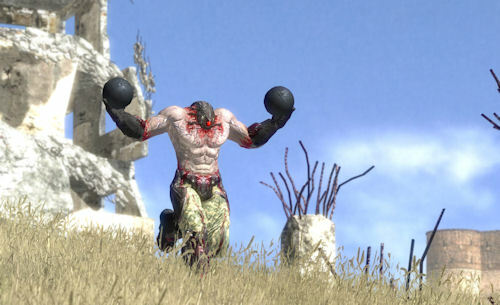 E3 2011 - Serious Sam 3: BFE Hands-On Preview, Serious Sam Double D Too! Page created in 0.2723 seconds.